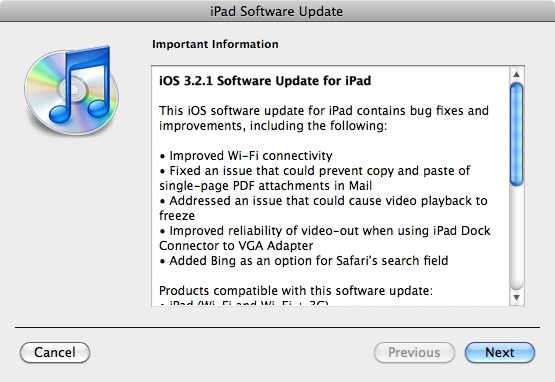 Amid the iOS 4.0.1 update hoopla yesterday, Apple also released iOS 3.2.1 for the iPad. I installed the iOS 3.2.1 on my 32GB Apple iPad this morning. The whole affair took about 20 minutes to download and install the software on my iPad. 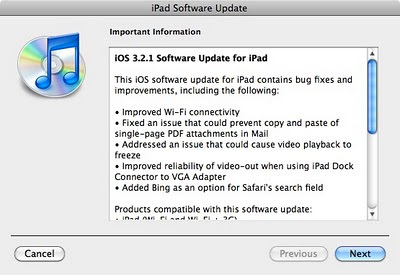 The big fix in iOS 3.2.1 is to address the Wi-Fi connectivity issues that some people have been having since the Wi-Fi only model went on sale earlier this year. I've run into this problem once or twice since April 3rd when I picked up my iPad on launch day. Unlike app updates, you will need to download iOS 3.2.1 by connecting your iPad to a Mac or PC and syncing it with iTunes 9.2. I had to select my iPad in the source pane and then click the "Check for Update" button. The upgrade was painless, and I would expect nothing less from Apple. Using my upgraded iPad at work and at home, I did not notice any real differences between iOS 3.2 and 3.2.1; but then again I didn't have the Wi-Fi issue at the house or office.